You are here: Home / Startup & Funding Tips / Startup Valuation – Why Not Listen to the Market? 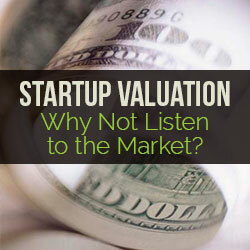 Startup Valuation – Why Not Listen to the Market? Business valuation has for a long time been perceived as more art than science, which is a polite way of saying, “It’s a big, fat guess.” Nowhere is this perception more prevalent than when the discussion turns to the valuation of startups. If the appraisal of established companies in established industries is challenging and fraught with uncertainty, then the appraisal of startups truly seems to many like a turn at a roulette table. Many competitors are invisible (Google isn’t afraid of Microsoft – they are afraid of what’s happening in a closed garage a couple of miles away). Startups are believed to have few or no comparables. The problem with using a DCF model to value a startup is that both of these inputs are mostly guesses, with various stages of educated-ness. We can estimate discount rates of up to 25% or so with some mathematical and empirical rigor. Where discount rates are higher than 25% (frequently are 50% or more for startups), the portion of the discount rate that is supported by empirical data drops rapidly. As for cash flow projections, those that are prepared by Fortune 500 companies with legions of analysts and millions of consulting dollars at their disposal are a white-knuckled ride for investors even one year out. For startups, with less data and resources available, and investors demanding cash flow projections up to 5 years in the future, cash flow projections must be considered a purely aspirational document. Suspicion of valuations of startups relying on a DCF technique are well-placed. A much more reliable, yet infrequently used method for valuing startups is using the guideline public company (“GPC”) method, in which GPCs comparable to the subject company are identified and their market pricing data is used to infer a market-based value of the startup company. The GPC method is overlooked even by professional appraisers because of the perception that it can only be applied to the appraisals of large, established companies. However, if you consider public equities in the US, Canada, Europe, and Israel, there are over 4,000 stocks which are publicly traded with revenues of under $2 million – a large portion of those are pre-revenue or of de minimis revenue. 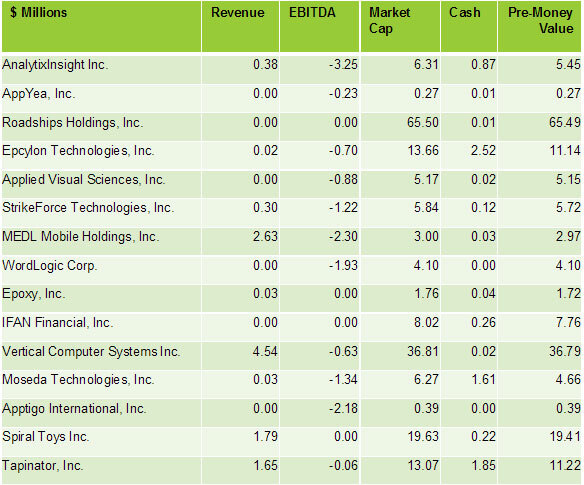 Many of those companies are effectively startups – little to no revenue, and their value from an investment standpoint is what investors and entrepreneurs hope those companies will become, and almost all such companies are technology companies – the only kind of small companies that can realistically go public because there is investor belief that they can achieve scale. If we are inclined to believe that the harmonic mean price/company is the correct statistic and our company reflects a mean of sorts in terms of its characteristics, then this analysis indicates that our company’s pre-money value is $1.5 million. If comparable public companies can be identified, this technique should be used alongside other valuation methods, and you will frequently find that sufficient comparability can be established that the guideline public company method may be your leading tool for appraising emerging technology companies. 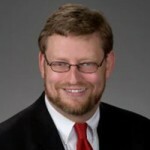 Michael Blake is the founder of Arpeggio Advisors (www.arpeggioadvisors.com), a boutique business appraisal and corporate strategy advisory firm in Atlanta. Michael’s background has included work in venture capital, investment banking, and public accounting. Michael has particular expertise in the appraisal of firms in the fields of professional services, information technology, aerospace, and alternative energy. In addition, he has developed specific expertise in the appraisal of intellectual property and intangible assets. Michael is an active educator. He is a Special Instructor of Business Valuation in the Georgia Tech/Emory University TI:GER (Technology Innovation: Generating Economic Results) program. In addition, he is regularly invited to provide instruction on entrepreneurship, corporate finance, and business valuation to graduate level classes at prominent universities across the South.